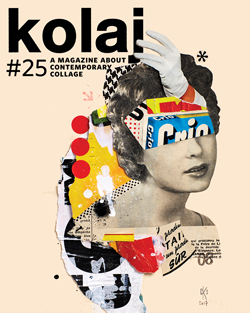 In Kolaj #25, Todd Bartell begins the first of a four part series exploring the notion of Uncollage. Here is his introduction. 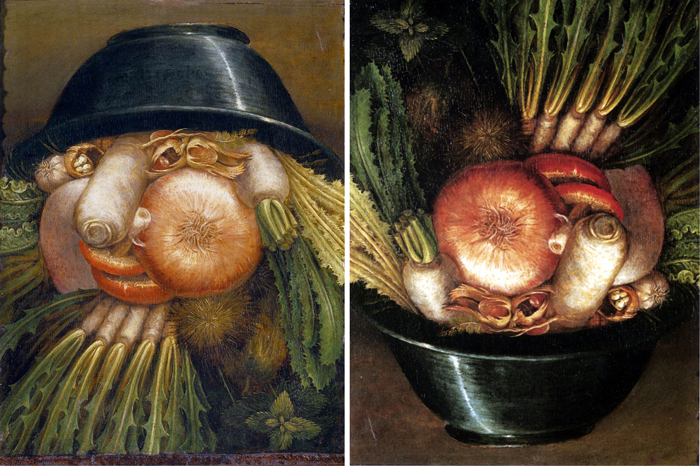 While collage transformed modern art and is recognized as a preeminent factor in the move away from 19th century European fine art practices, it remains unsung in many ways and instances. Even after a century of collage proliferation, the scope of collage has yet to be fully categorized, and certain of its aspects remain unnamed. (Is it even possible to fully catalog the vast potential of collage?) As I am fond of saying to my students, “Ever since the Big Bang, it’s ALL collage!” But the limitations of the word’s literal definition are sometimes at the root of missed opportunities. Despite that paintings are made of paint, which itself is made up of minerals in a binder—collage—it does not serve us well to call paintings collages, even though in the broadest sense they are collages. On the other hand, if we hold too steadfast to collage’s root definition—pasted paper—then surely some aspects of collage will remain overlooked and underrepresented. After all, today’s digital collage artists make collages without ever using paper or glue, and it was not that long ago that people, curators, and even artists rejected digital collage as valid art. Some works of collage have flown under the radar of historians and curators for centuries, and still remain uncredited as collage despite the practices they reveal. If we know how to look for the evidence of collage’s unprecedented eclecticism—or know what to call it—then at least a few more possibilities can be pulled into the ever-expanding definition. 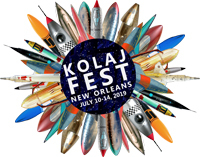 In July 2018 at the first annual Kolaj Fest New Orleans, I gave a talk focused on “uncollage”: a word I coined to describe a particular and recurring situation in the history of painting that I believe merits a new collage terminology. 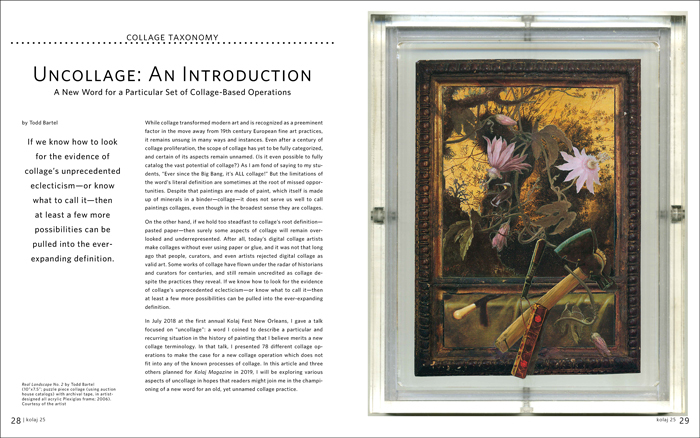 In that talk, I presented 78 different collage operations to make the case for a new collage operation which does not fit into any of the known processes of collage. 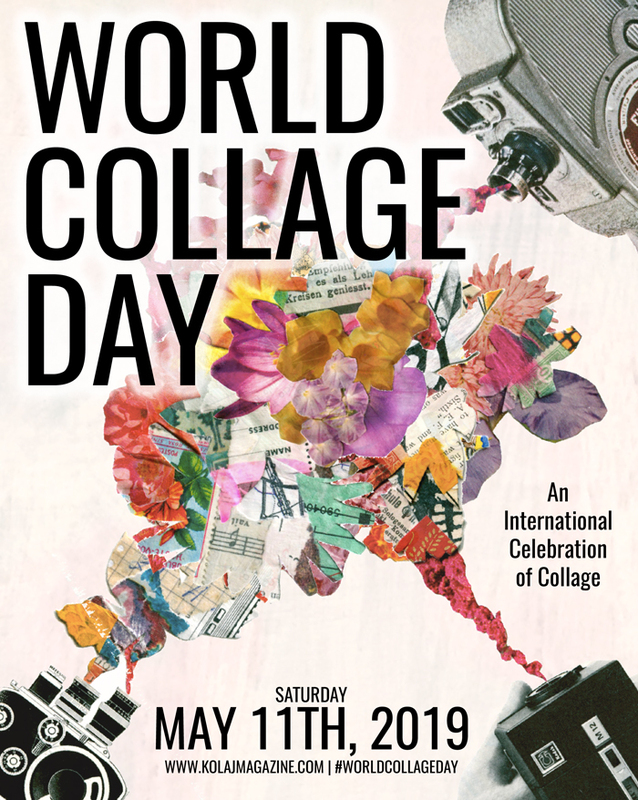 In this article and three others planned for Kolaj Magazine in 2019, I will be exploring various aspects of uncollage in hopes that readers might join me in the championing of a new word for an old, yet unnamed collage practice. Todd Bartel is a collage-based artist. His work assumes assembled forms of painting, drawing and sculpture that examine the roles of landscape and nature in contemporary culture. Since 2002, Bartel has taught drawing, painting, sculpture, installation art and conceptual art at the Cambridge School of Weston, Weston, Massachusetts. He is the founder and the Director of the Cambridge School’s Thompson Gallery, a teaching gallery dedicated to thematic inquiry, and “IS” (Installation Space), a proposal-based installation gallery. Bartel holds a BFA in painting from Rhode Island School of Design and an MFA in painting from Carnegie Mellon University. Bartel’s Kolaj Magazine Artist Directory page has more information, as well as his Tumblr, toddbartel.tumblr.com.